If you want to teach your child to read using a structured reading program, you have a number of different options. If you are interested in simple, low cost, gimmick-free early reading programs, in which you play an important role in teaching your child to read, you should have a look at one of the following handbooks. All of the reading programs described in the handbooks below contain a large element of phonics teaching and come highly recommended. Most have been around for a number of years and have been used successfully to teach a great many children to read. The majority of these early reading programs lay out clear lesson plans so that you simply need to work methodically through the book with your child. As long as your child makes it to the last page, they should be reading by the end of it. Some books offer a detailed, scripted guide of exactly what to say to your child and how to say it. Others are less prescriptive. Most of these books on early reading programs include ideas for activities and games which you can do with your child to keep them motivated. These books have the advantage that they give you an entire rule book in your hands. You can see at a glance how your child is progressing and what is coming up next. You can easily repeat sections if you think your child needs further help. The book also provides a handy reference at a later date if your child needs to revise certain rules. These early reading programs do, however, rely on you being the primary motivator of your child. 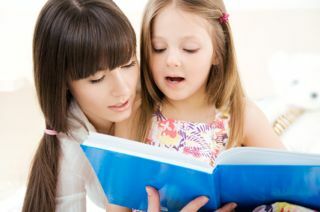 With no gimmicks and props to help, it is up to you to keep your child motivated until they reach the end of the book. The books do, of course, provide ideas on how to do this. Alternative programs include multisensory early reading programs, which come with a range of teaching materials such as workbooks, DVDs, levelled reading books, posters, flashcards and song books to hold your child's interest. In addition there are online reading programs which use computer-animated games to keep your child motivated while they learn to read. You could also consider using a series of levelled easy reader books alongside your chosen program, so that your child can practice what they are learning in real stories. 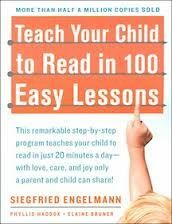 Teach Your Child to Read in 100 Easy Lessons by Siegfried Engelmann was published in the USA in 1986. It is designed for teaching three to six year olds to read at home using phonics. Unlike other early reading programs, it uses a unique system of letter marking (DISTAR) which is used to accelerate the teaching of many irregularly spelled words. Towards the end of the book the marks go away and simple stories are provided which your child should be able to read based on the letter-sound relationships they have learnt. Particular emphasis is placed on teaching the essential skills to blend the sounds into words. The book contains 100 twenty–minute lessons that are clearly scripted including how to motivate, teach, and correct your child. You need nothing other than the book plus paper and pen to teach this program. Read more. 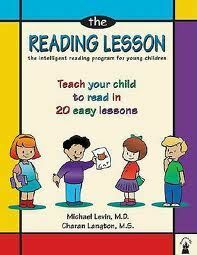 The Reading Lesson by Michael Levin was published in the USA in 2002 and is designed for home use. It gives an easy to follow recipe for teaching your child to read in twenty lessons. 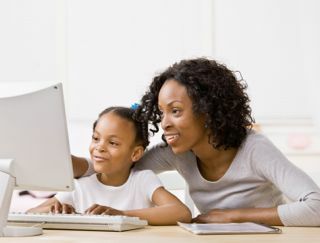 Each lesson takes around one to two weeks, assuming you work with your child for about 15 to 20 minutes a day. Each lesson introduces three or four new sounds as well as new sight words and uses exercises and short stories to practice these new sounds and words. The program uses a controlled vocabulary of developmentally appropriate words which correspond closely to the most commonly used words in English. Read more. 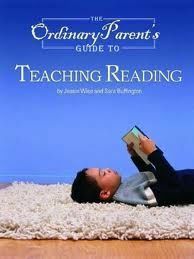 The Ordinary Parent's Guide to Teaching Reading by Jessie Wise and Sara Buffington gives parents a simple, direct, scripted guide to teaching reading. The clear directions and the standard format of each lesson mean that minimal preparation time is needed. The only accessories required are blank index cards, a pen and a magnetic board and alphabet tiles. There are 231 well-structured, daily lessons, which take around 10 to 15 minutes each. Optional games and songs at the end of each lesson help reinforce what has been learnt. Be aware that the book has no pictures and the teacher's instructions are on the same page as the child's sentences, which can be a bit overwhelming for some children. However, the lack of pictures can also help to maintain your child's focus on decoding the words. 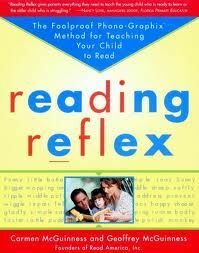 Reading Reflex was written by Carmen and Geoffrey McGuinness and published in the USA in 1999. It was originally created for children with reading problems, but was then adapted for home and classroom use. The teaching approach is based on synthetic phonics and stresses the 43 sounds of the English language, teaching from sound to letters. Clear teaching directions are given and reading games are included to keep the learning fun. Lessons are supported with cards which you cut out from the book, mostly of individual letters. The book includes an assessment test at the beginning. Read more. 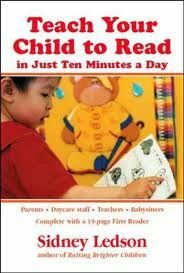 Teach Your Child to Read in Just Ten Minutes a Day by Sidney Ledson, most recently published in 2006, contains a highly simplified phonics early reading program originally devised in Canada in 1972. It is an easy-to-read, instructive book designed to be read in advance of starting to teach your child to read. Unlike most of the other early reading programs, there are no day to day lesson plans, but instead there is a list of basic steps you should take to teach your child the first 15 letters, enabling them to read their first 100 words. A later chapter then gives basic steps for introducing the rest of the letters plus common letter combinations. A key part of the program is a board game, which you make yourself, that helps motivate your child in the early stages of learning to read. There are also many other ideas for simple games and activities to engage your child and make it fun for them to practice the key reading skills of word blending, letter sound association, and left-to-right decoding. Follow the games as described, or get creative and think of your own variations to fit your child's interests. 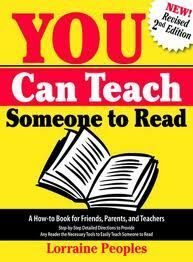 You Can Teach Someone to Read by Lorraine Peoples was originally published in the USA in 2000, with a second edition released in 2011. It proposes using a combination of memorising sight vocabulary, learning the most commonly used phonics rule and developing basic comprehension skills in order to teach reading. It is a user-friendly book with easy to follow lesson plans, built in evaluation, and tips on how to tap into your child's preferred learning style. Each lesson gives a detailed procedure for the day and how long it should take. Phonics rules are turned into silly stories illustrated by cartoons to make them easier to remember. Numerous activities also help to keep the lessons fun. 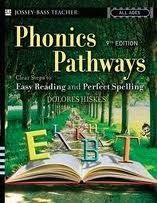 Originally published in 2005, Phonics Pathways by Dolores G. Hiskes offers a straightforward, methodical approach to teaching reading. Lessons are organised by sounds and spelling patterns with simple step-by-step directions of what to teach. The patterns are introduced one at a time and slowly built into syllables, words, phrases, and sentences. Letters are illustrated as pictures to help make them easier to remember. Suggestions for activities and games are also included. The book contains all of the spelling rules and so can be used as a complete spelling reference in later years.